I remember when I was younger I played Spyro alot. I have had the chance to try something quite similar! I was able to go to Best Buy and play a short demo of the new Skylanders Giants game. 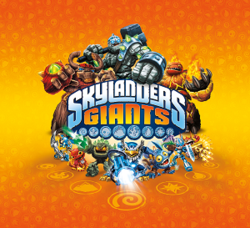 Skylanders Giants is a follow up of the last game Skylanders: Spyro's Adventure. The game is actually pretty neat. It tells you how they Giants were separated from the others. You can use the provided portal and switch characters. You can battle your friends too! You basically beat up characters, collect gems and reach an objective. This is a great game for any kid honestly because the violence involves no blood at all. Why should you get this for your kid(s)? Because your kid can learn puzzles and cooperation and have fun! You are encouraged to buy real game pieces that you can scan into the game but it is not completely necessary. I do however feel this game is going to be a hit for the 2012 Holiday Season! I do not feel that it is much different than the last game, other than better graphics and bigger characters. It is still a cute hit though. Personally, until my kids ask me to buy it, I could not see myself purchasing it. I will however play if a friend has it. Depending on what platform you want to buy this game for, it comes in Xbox 360, Playstation 3, Nintendo 3DS, & Wii. Check out more via Best Buy Today! I actually got this for my nephew for Christmas! He's going to flip when he sees it!